Researching dark matter requires quite a bit of labor. Any little flicker or radiation can throw off the readings and make hundreds of hours of experimentation useless. 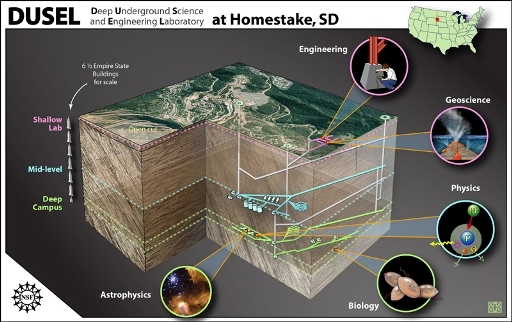 That’s why the city of Homestake, South Dakota, is planning to turn an old goldmine into the world’s deepest laboratory, dedicated to the Large Underground Xenon (or LUX) detector. The lab is 4,850 feet deep, which is over 6 Empire State Buildings. Meet the Homestake DUSEL! The history of the Homestake site is fascinating; but one of the crucial details to me is that the lab’s current depth of 4,850 feet is nowhere near the final depth of the old mine shafts. The deepest, darkest corner of the old mining facility is an incredible 8,000 feet deep! That means there’s another 3,150 feet of untouched space in the bowels of the earth just waiting to be turned into a real-life Umbrella Corporation, pumping out hordes of designer disease and evil.